Dentures are another dental treatment procedure that helps replace missing teeth. It is helpful and suitable for those people who have their teeth, but they are not fully functional. At Boss Dental Care, located in Corpus Christi, our dentists recommend either removable partial dentures or complete dentures. The selection of dentures type depends on your oral health. We design fully functional and comfortable dentures with a similar appearance as your natural teeth. The dentures process at Boss Dental Care is less painful, where our dentists, Dr. Packard and Dr. Boss replace the missing teeth. They complete this process either by taking out or putting back the affected tooth or teeth into your mouth. Besides, people in Corpus Christi may experience tooth loss due to any periodontal medical complications, traumatic injuries, tooth decay, etc. Therefore, Boss Dental Care provides denture procedures to facilitate these people. We provide services for complete and partial dentures depending on your requirement and oral health. We are aware that the needs and requirements of dentures for everyone is different, therefore we provide you many treatment options. Typically, we recommend partial dentures if you lost few teeth. Meanwhile, complete dentures are suitable for those when there is need to replace all teeth. After the provision of the suitable denture, Dr. Packard and Dr. Boss also provide suggestions about aftercare of dentures. Since it is important to practice healthy oral hygiene when wearing dentures. It is also important to properly brush and clean your dentures to increase their lifespan. The complete dentures consist of an acrylic base having the color of flesh. The design of the base in dentures is fixed on your gums. The base of the upper denture covers the palate, whereas lower denture covers the tongue. At Boss Dental Care, we can also customize the dentures according to your requirements and needs. At Boss Dental Care, we make complete dentures after removing teeth from your mouth. You can use customized complete dentures within 3 to 6 months after the removal of your teeth. However, if you need immediate dentures, Boss Dental Care also help you in this regard. We can make immediate dentures for you and place them immediately after the removal of your teeth. So, it allows you to use immediate dentures during the healing period. Since bones and gums might shrink with age, therefore, we recommend immediate dentures as a temporary solution. The self-image of people is negatively influenced by the loss of the full or partial tooth. For this reason, full and partial dentures are reliable and time-tested methods for treating partial or complete tooth loss. This is the method that the expert dentists at Boss Dental Care recommend to their patients. It is because dentures assist you in the transition to successful denture wearing. The dentures we provide to our people in Corpus Christi give a natural look to your teeth up to a certain extent. Dentures are ideal for you if you have advanced dental problems which make saving the teeth difficult or impossible. One cause for tooth loss is rampant decay caused by severe cavities on most if not all the teeth. Another cause for tooth loss is an advanced periodontal disease where you lose bone and the teeth become loose. When Should Dentures Be Replaced? Your mouth undergoes natural changes with age. Your bones and gums can shrink and recede, cause changes in your jaws. There is no lifespan of dentures, and their replacement is dependent on its wearing. On an average, dentures need replacement between 3 and 8 years. But, it mainly depends on the rate of deterioration of dental material and changes in the wearer's jaw. Dentures are made up of high-quality material, but they are not permanent. Boss Dental Care, recommends the people in Corpus Christi to give proper care to your dentures to increase their lifespan. We also recommend you realign your dentures frequently to increase their longevity. Should I Fix My Teeth or Take Them Out and Get Dentures? It is always best to fix your natural teeth when possible. However, many patients choose to go with extraction and dentures for a number of reasons. Perhaps your teeth are damaged to the point where restorative treatments like crowns or implants are simply not in the budget. Severely damaged teeth might not even be restorable. Or perhaps the teeth have lost so much bone from a periodontal disease that they are loose and falling out. Dentures are also sometimes the preferred alternative to fixing if you have a history of tooth decay. Unfortunately, sometimes it's simply genetic - your parents had bad teeth and you inherited them. 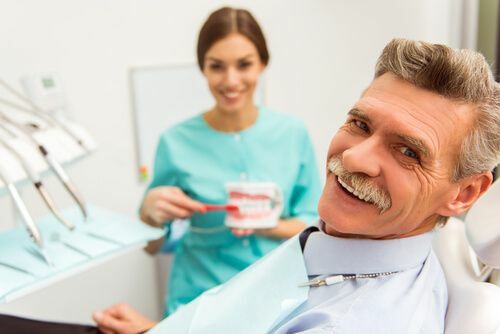 If you have lost a number of teeth to decay and have no reason to think that this is going to change, you might be better off to simply have the remaining teeth extracted and a set of complete dentures made for you. Will My Dentures Look Good? Dentures can look very good and lifelike. Modern materials allow us to make dentures which appear very natural. Sometimes, people who have lost their teeth and are planning on replacing them with dentures make the mistake of telling the dentist, "I want white, white teeth, just like a Hollywood actor!" That is a mistake. Those teeth look good on camera, but the reality is that in real life, they look totally unnatural. You can go a shade or two, or maybe even three, whiter than your natural teeth, but if you want an attractive, real-looking smile, you should stay close to your original shade. Thanks to modern materials, your dentures will be as translucent and subtly shaded as your original teeth. Unless you choose to tell people that you are wearing dentures, they do not need to know. How Will My Life Be Different With Dentures? You will feel more self-confident. You will not have to be afraid to smile and you will lose the prematurely-aged appearance that can go hand-in-hand with missing teeth. Gum and bone support changes over time which means that a once fitting denture may not fit well in the future. If this is your case, we can reline the inside of your denture to make it fit tight against your gums again. Sometimes a denture is loose because there is not enough bone height in the jaw to keep a denture stable. If this is your case, implants can be added to your denture to keep it in place. Before your teeth are extracted, we take a series of impressions of your mouth. With these impressions, the denture lab will make a denture based on what your mouth will probably look like after the teeth are extracted. The immediate denture is full made before we take out all of your teeth. On the day that we remove the remaining teeth, we will deliver the immediate denture. With the immediate denture, you walk out with teeth the same day. The immediate denture is used as a healing denture and will need to be relined or replaced as the gum and bone shrink back with healing. A series of adjustments and refinements are normal as you get used to wearing your new denture. If you are considering complete dentures as a means of correcting your smile, contact Boss Dental Care at 361-245-5400 or use the form on our Contact Us page. We are located at 801 Everhart Rd, Corpus Christi, TX 78411.